DIGIC 8 used for first time! Both the Bluetooth agency and the Russian Eurasian Economic Commission do show that Canon registered the new mid level EOS-M50 camera. Camera will be officially announced in Q1 2018. EOS M50 will be first APS-C compact camera in the Canon lineup to shoot 4K. Photo and most specs added. What is Video Creators Kit? Raw video mode? Most probably it is same or better STM lens and microphone. no PDAF in 4K and 1.6X crop, what a fail! MELVILLE, N.Y., February 25, 2018 Upgrading from a smartphone camera to an entry-level interchangeable lens camera (ILC) can be considered to some people a daunting task. Canon U.S.A., Inc., a leader in digital imaging solutions, supports those looking to advance their skills by continuously developing and evolving its gear. Today, the company announced their latest additions to its all-encompassing lineup of digital cameras: the EOS M50 Interchangeable Lens Camera, the first Canon EOS M-series camera with 4K video recording which is four-times the size of full HD 1080, and the EOS Rebel T7, the latest addition to the wildly popular EOS Rebel line of entry-level DSLR Cameras, with an upgraded CMOS sensor to deliver sharp, high-resolution images to capture life's key moments. For photographers actively seeking to upgrade their skills, the EOS M50 is an all-around, entry-level camera with an extensive list of user-friendly features that encourages users to broaden their creative visions. Providing improved Dual Pixel CMOS AF, a 24.1MP APS-C CMOS sensor resulting in less noise and high definition in low-light situations, and the capability of recording 4K video, the EOS M50 will capture crisp, photographic expressions in various situations. "Our core goal when developing new entry-level interchangeable lens cameras for our consumers is to meld high-quality features and usability together. In listening to our customers, we believe we have achieved this goal with both the EOS M50 and EOS Rebel T7, " said Yuichi Ishizuka, president and COO, Canon U.S.A., Inc. "With enhanced features for photographers of all skill levels to enjoy, both cameras demonstrate Canon's commitment to developing and manufacturing best-in-class quality imaging solutions." The EOS Rebel T7 DSLR camera, featuring an upgraded CMOS sensor of 24.1 megapixel resolution, is the successor to the EOS Rebel T6. 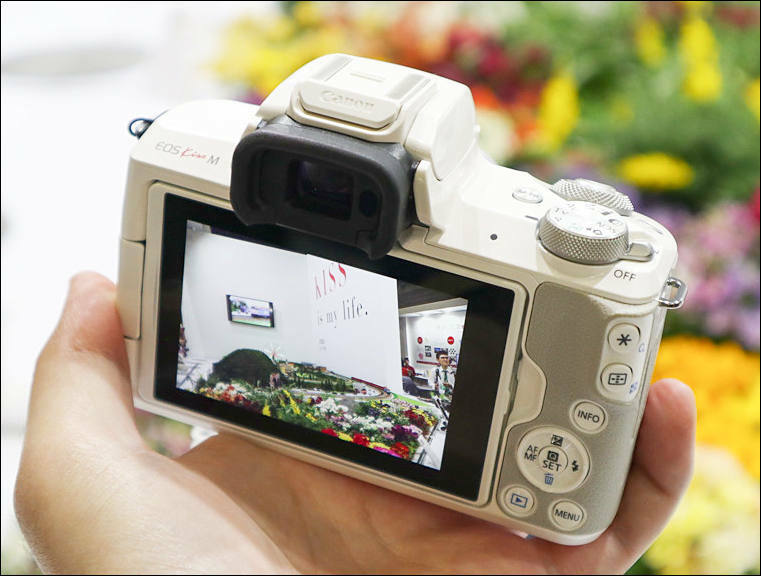 Offering easy sharing of high-quality photos and videos on social media sites, the EOS Rebel T7 provides continuous shooting up to 3.0 frames per second (fps), a nine-point autofocus system and a three-inch LCD monitor, offering users a multitude of options to capture and share life's important moments. For an additional cost, both products are also eligible for the reliable protection of CarePAK PLUS, Canon's optional service plan, which includes accidental damage protection and Image Recovery, designed to retrieve irreplaceable images or videos otherwise lost or corrupted. CarePAK PLUS, along with all Canon camera service plans, is performed exclusively by Canon's renowned service and support team. The Canon EOS M50 is scheduled to be available in April 2018 for an estimated retail price of $779.99 for the body only. The EOS M50 will also be available with the EF-M 15-45mm f/3.5-6.3 IS STM lens in both black and white for an estimated retail price of $899.99^. Additionally, the EOS M50 will be sold with the EF-M 15-45mm f/3.5-6.3 IS STM and the EF-M 55-200mm f/4.5-6.3 IS STM in black only for an estimated retail price of $1,249.00. A Video Creator Kit will also be available for the EOS M50 for an estimated retail price of $999.99. The EOS Rebel T7 is scheduled to be available in April 2018, and will be sold as a lens-and-body kit with the EF-S 18-55 f/3.5-5.6 IS II for an estimated retail price of $549.99. 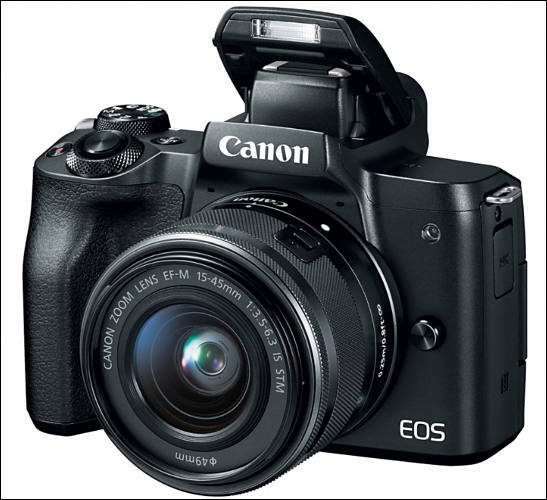 United Kingdom, Republic of Ireland, 26th February 2018 -- Canon today launches the EOS M50, the latest addition to the EOS M series and Canon's most intuitive and technologically advanced mirrorless camera yet. Designed for today's modern adventurers, the EOS M50 is Canon's first mirrorless camera to feature 4K movie capability, a Vari-Angle touchscreen and Canon's latest DIGIC 8 image processor. Coupled with Bluetooth® and Wi-Fi for seamless connectivity, an APS-C sized 24.1 Megapixel CMOS sensor for beautiful soft backgrounds and sharp, high-resolution images in low-light situations, and 10 frames per second (fps) continuous shooting for capturing the most fleeting moment in rich defined detail. Packed with the latest technology, the Canon EOS M50 distils DSLR quality into a compact body, sleek enough to be taken on any adventure. For a super-fast and responsive autofocus system, the camera's Dual Pixel CMOS AF speed enables photographers to capture crisp, high-resolution images and Full HD videos with beautiful depth of field control for sharp subjects and soft backgrounds. The cinematic look and feel achieved by the 24.1 Megapixel APS-C CMOS sensor reaches new heights with the addition of 4K movie capture, for enriched detail with four times the resolution of Full HD. The EOS M50 features Canon's latest DIGIC 8 image processor, a first for any Canon camera. The new processor powers many of the cameras functions, including: 4K movie recording, 4K time-lapse and 4K frame grabs from 4K movies; fast continuous shooting speed and a standard maximum ISO of 25,600, which allows for low light shooting whilst still obtaining sharp images. The DIGIC 8 image processor also supports a wide range of improvements in autofocus, Auto Lighting Optimiser, Digital Lens Optimiser and Highlight Tone Priority, for superb high-quality images ready to share straight from the camera. The EOS M50's bold and contemporary design offers a modern take on a traditional shooting experience, with its large centrally mounted electronic viewfinder. Users can also explore creative shooting angles, take great selfies, and easily record vlogs using the 7.5cm Vari-Angle touchscreen, enabling multiple perspectives for improved story capture. Evolved touchscreen capabilities enable Touch and Drag AF, allowing for instinctive and seamless autofocus point adjustment without taking your eye away from the viewfinder. The Canon EOS M50 integrates effortlessly with smart devices, using the free Canon Camera Connect app for iOS and Android. A constant low energy Bluetooth connection allows a smart device to 'wake up' the camera, perform remote triggering, and facilitates a simple switch to Wi-Fi for remote Live View shooting and transferring images. Photos and videos can be transferred from the camera to smart devices^3^ automatically for easy sharing on social media sites, making the step from capturing to sharing with the world seamless. In addition, content can be cloud stored to Canon Irista or synced automatically and wirelessly to PCs and Macs with Canon's Image Transfer Utility 2 installed. More images, more storytelling. 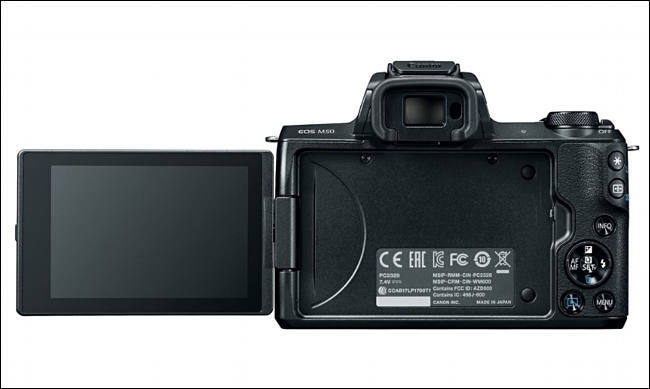 The EOS M50 is the first camera to feature the new CR3 14-bit RAW file format, as well as a new C-RAW option that creates full resolution RAW files whilst saving approximately 30 to 40% on the file size of standard RAW files -- increasing the number of images that can be stored on a memory card yet retaining the flexibility of RAW images. The EOS M50 is compatible with Canon's range of compact and high-quality EF-M lenses, allowing users to create their ideal compact system. For ultimate storytelling choice and flexibility, EOS M50 is compatible with over 80 renowned EF and EF-S interchangeable lenses via the Mount Adapter EF-EOS M. This extends to the exploration of flash photography, thanks to a hot shoe that allows simple connection of Canon's Speedlite flashes, and high-quality audio with a 3.5mm mic input for connecting a dedicated microphone such as Canon's Directional Stereo Microphone DM-E1. Canon has produced its most intuitive and powerful mirrorless camera to date, delivering the latest in photographic technology and capabilities. The combination of image processing power, 4K movie capability and the latest in sensor technology, empowers the world's modern adventurers to start doing their stories justice. The EOS M50 is available to pre-order from Canon's online store and official Canon dealers from 26^th^ February 2018. Other lens bundles will also be available from selected retailers and Canon's Online Store: www.store.canon.co.uk. does it crop the sensor when recording 4k or it uses all the sensor? 4K has significant 1.6x crop. And, surprise, Dual Pixel isn't available. So actually it is mostly unusable in 4K. And btw it lacks even 30fps. I think the strategy is "try not to cannibalize sales of higher-end cameras while offering specs that on paper rival those of the competition." Issue, most probably is with whole Digic LSI architecture and approach. And it is some camera team members who hold to this solutions to save their positions. @Vitaliy_Kiselev My first thought was that it was something related to Digic limitations, but then I figured that one of the reasons for the lengthy delay in coming out with a new camera supporting 4K would have been a design / test / build cycle for new Digic... which, in theory, means that the engineers should have at least been able to target full sensor 4K. 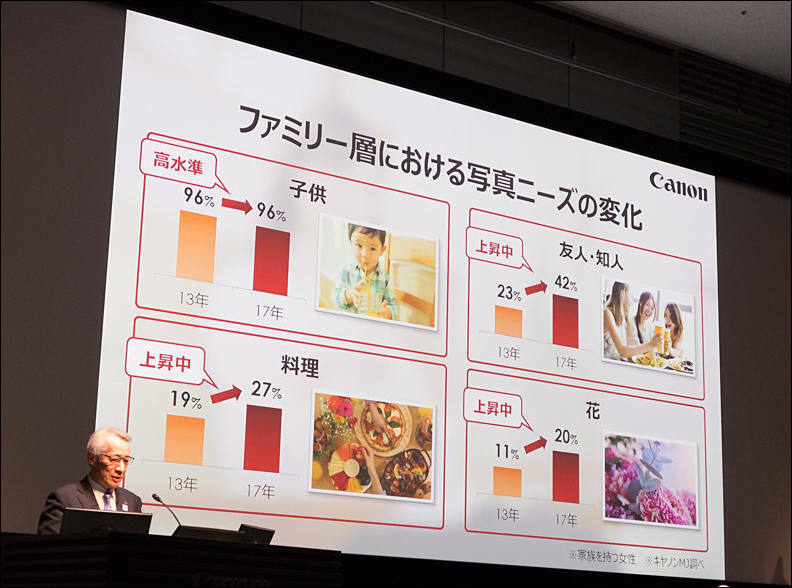 TOKYO — Canon will shift more of its focus to mirrorless cameras, a change in strategy spurred by sharp growth in the market. 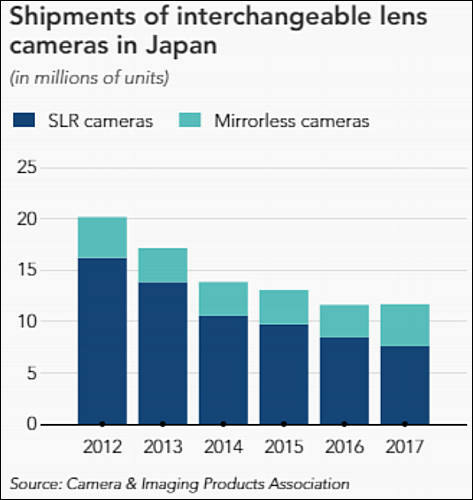 The company boasts a commanding share of the global single-lens reflex market but was reluctant to enter the mirrorless field over concerns about cannibalizing SLR sales. Canon said Monday that it will release an entry-level mirrorless camera next month. 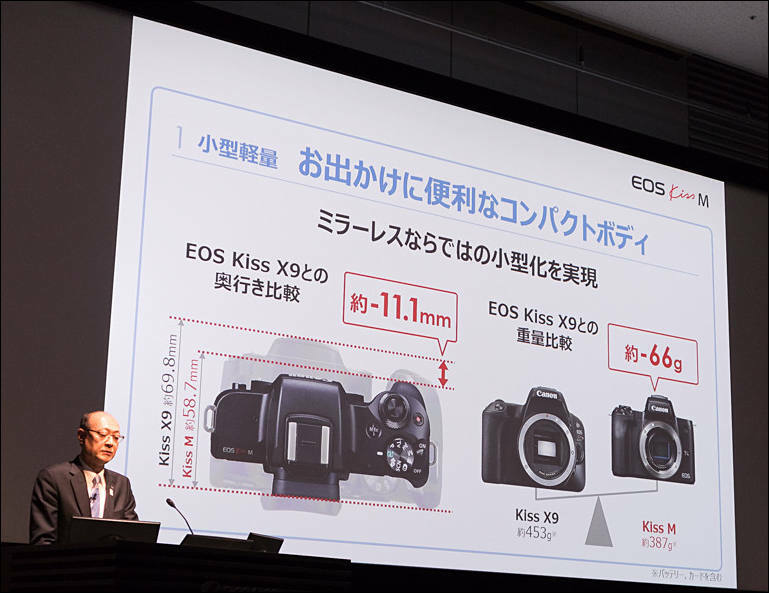 The product is positioned as “a strategic model” for mirrorless cameras, according to Masahiro Sakata, president of Canon group member Canon Marketing Japan. Canon hopes that the new product will attract demand from families, including mothers who enjoy taking pictures of their children. 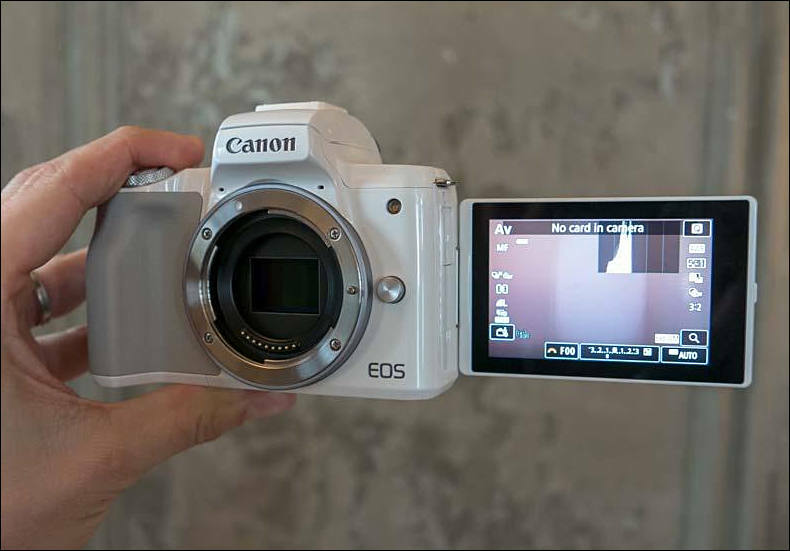 A latecomer to the mirrorless market, Canon released its first model in 2012 under the EOS M brand. The company held 23% of the domestic market for these cameras in 2017, ranking second behind Olympus. It aims for the top spot with the new offering. With mirrorless cameras rapidly gaining popularity and rivals like Sony breaking into SLRs, Canon decided it must “actively roll out products for a growth market even if there is some cannibalization,” Sakata said.